Trace McSorley’s memorable Penn State career will end Tuesday. His legacy is more than just statistics. Trace McSorley will try to end his collegiate career on a high note in the Citrus Bowl against Kentucky. ORLANDO -- It all began for Trace McSorley on Jan. 2, 2016, when he first took the reins as Penn State’s quarterback in relief of injured starter Christian Hackenberg in the second quarter of the Nittany Lions’ Gator Bowl game against Georgia in Jacksonville, Fla.
A redshirt freshman whose only game action up to that point had been some mop-up duty, McSorley impressed with his competitiveness and his confidence. He threw two fourth-quarter touchdown passes that weren’t enough in the 24-17 loss, but the Lions coaches and players knew they had a special quarterback for the long haul. Almost three years to the day later, it ends some 140 miles south of where it started. McSorley will play his final game Tuesday in a Penn State uniform, the Citrus Bowl matchup against Kentucky at Camping World Stadium. It will mark his 40th consecutive start after having led the Nittany Lions to a 31-8 record in the previous 39, including a Big Ten championship and two New Year’s Six bowls. “It’s hard for me to say that I would have thought that,” McSorley said Saturday of his streak of starts. “Obviously, I imagined having success and that was a goal, but for it to have been planned out and played out like this, I probably wouldn’t say that. For those who have been with McSorley for most or all of his five years in the program, it’s been more than just the on-field performance and the 16 school records that he takes into Tuesday’s game. It has been the leadership, the competitiveness, the consistency and the work ethic that leaves a legacy that few quarterbacks in Penn State history have established. Trace McSorley was recruited to Penn State by Bill O'Brien and then James Franklin, after O'Brien left for the Texans. Perhaps the best example of McSorley’s leadership came early in his first year as the starter. The Nittany Lions slipped to 2-2 following a 49-10 pounding at Michigan, dropping them to 16-14 in Franklin’s career and making fans wonder if the head coach was getting the right players and coaching them properly. The Lions won the next nine games and the Big Ten championship before a last-second loss to Southern California in a wildly entertaining Rose Bowl. They followed that 11-3 season by going 11-2 and winning the Fiesta Bowl, and a victory over Kentucky will give them three consecutive seasons of at least 10 wins for the first time since beginning Big Ten competition in 1993. Trace McSorley drops back to pass in his first collegiate start, a win over Kent State in 2016. McSorley and Farmer were part of the 2014 recruiting class assembled by Franklin and previous head coach Bill O’Brien while the program was trying to rebuild following NCAA sanctions that limited it to 65 scholarships, 20 below the maximum. Seven of those recruits will make their final appearances Tuesday. McSorley and some of the fifth-year seniors took a victory lap around the field at Beaver Stadium after their last home game, a Nov. 24 win over Maryland. “We were just doing it with those guys that we all came in with, a group of guys that fought hard every single day and worked their butts off to bring this program back and bring it to the spot where we’d be competing for top championships and being a top-level contender every year,” McSorley said. Trace McSorley takes it all in after his final game in Beaver Stadium. Rahne originally recruited McSorley when he was on Franklin’s staff at Vanderbilt as McSorley was leading his team at Briar Woods High School in Ashburn, Va., to four state championship games, winning three. Other schools looked at McSorley and thought “defensive back,” but Franklin and Rahne felt he was a quarterback all along, which is why he followed them to Penn State when Franklin took the job there in January 2014. It’s fair to say they were correct in their assessment after 11,275 yards of total offense and 104 touchdowns passing and rushing, among other records. However, Franklin, who spent the 2005 season on the Green Bay Packers coaching staff, said he feels that once NFL teams get to sit down with McSorley and watch him work out, they’ll be sold. “There were doubts in high school, there were doubts in college, there will be doubts in the NFL,” Franklin said. “It’s just going to continue. I think he’s going to be one of those guys that constantly overcomes some of the false narrative that’s out there. 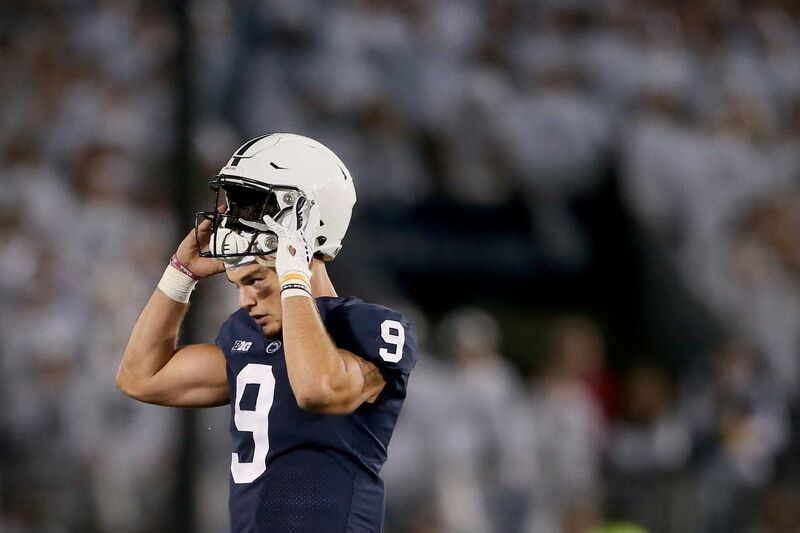 Before that, McSorley will play one final game for Penn State, receive a rousing send-off from the white-clad fans, and leave lasting memories. “It’s just been a great ride,” he said. “I’m extremely grateful and extremely thankful for the opportunity the coaches gave me to even come to a school like Penn State, and an opportunity to play and for putting me in good situations to be able to be successful.